You will enjoy a wide variety of meeting rooms and halls at Latham Springs, where facilities are perfect for retreats, conferences, conventions, and gatherings. Flexible spaces meet the needs for groups from 5 to 900, with many different configurations available. Stay in a beautiful Central Texas river valley, surrounded by green spaces, a prayer garden, waterfront, and quiet secluded wooded trails. 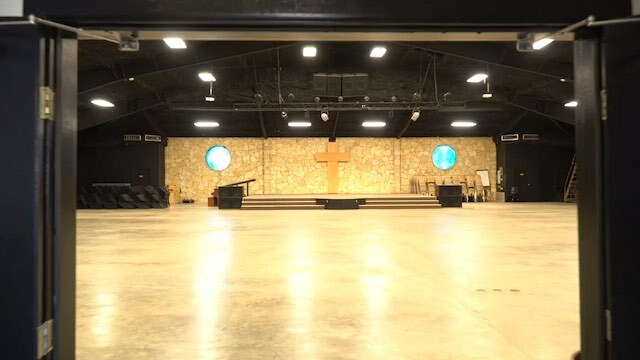 Miracle Hall is 3,600 square feet (60’ x 60’) of flexible space ideally suited for groups of up to 330 guests to gather for worship, dinners, training conferences, movies, or concerts. The facility was named “Miracle Hall” after God provided for the construction and funding of the facility in beautifully unexpected ways. Equipped with two basketball goals, a polished concrete floor, a stage (360 square feet), and a sound system, your group can accomplish its purpose. 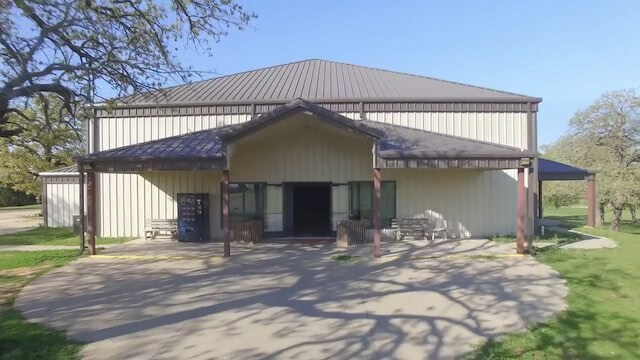 The building includes a foyer area, 2 areas that seat 25-30 each, and a covered side porch area with seating and ping pong tables. With approximately 10,000 square feet, our auditorium seats 933 and is ideal for large worship services, informal gatherings or energetic concerts and performances of all types. It is the largest indoor gathering space on the campgrounds. Acoustic treatments on the walls and a professional quality audio/video system with a light bar opens many possibilities for event planners. The chairs are completely moveable, making the space flexible. A spacious 700 square foot foyer with attached restrooms opens into the larger auditorium. The stage is approximately 700 square feet with built-in audio connections. Whether you are bringing a small or a large group, our cabins can accommodate a wide variety of groups. Cabins are numbered based on their proximity to the dining hall and are each equipped with dorm-style bunk rooms, bunk beds, and bathrooms and showers for each room. Each cabin also has a common meeting room large enough to accommodate the guests in the sleeping areas. Cabins contain bunk-style twin beds. Guests staying in cabins need to bring their own linens and pillows. A podium and a TV/VCR/DVD combo unit are available in all cabins except the RA Cabin. All facilities on our campus are fully air-conditioned. Comfortable for up to 46 guests in 2 dorm-style bunk rooms with 12 twin bunk beds in the left dorm and 11 in the right dorm.